The executive is offering to hold a workshop for first year dancers on Tuesday, March 20th from 7-9:30pm. Location to be advised. We recognize the fact that some people would benefit from extra help and we really do not want to you to give up. 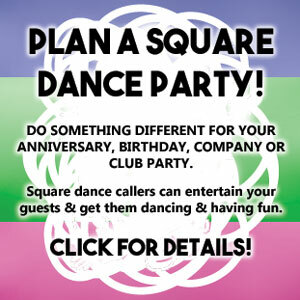 Square dancing is fun especially when you get more confident in executing your moves! The intent of this workshop is to help the newer dancers. (But we welcome “angels” to come and help.) We realize that some of our January student dancers have been ill. Lessons are only a small part of the learning process. It is the practice on the floor which solidifies the moves into your brain and body. When you have danced a few years they talk about “muscle memory”. It becomes almost a reflex action when you hear the call. So you need to attend regularly to become a good dancer. This workshop will not take place unless we have at least two squares of first year dancers. I would hope that all the January class will attend. Even with two squares the club is subsidizing the evening so we want to know for sure that you will attend. Please reply to Jean Lander to let us know one way or the other if you plan on attending. If we have not heard from you in a couple of days the phone committee will be calling you so to save this extra work, please respond. Spring Spree is coming up and we would like you all to have the opportunity to attend this fabulous event (right here in Peterborough). This is why the club is willing to put some money and the necessary work and time into this workshop. To celebrate the 50th Anniversary of the Spring Spree, Peterborough Mayor Daryl Bennett will be making a proclamation to declare the week beginning April 21st as “SQUARE DANCE WEEK IN PETERBOROUGH”! I find the message in this post to be very insulting – the idea of extra help is a good one but it should be left up to the dancer to determine if they think they need extra help not up to an unknown person to call you up and let you know you are not meeting the standard – this is not the way to encourage people. Our sincere apologies to the person who felt offended by the caller’s invitation to attend a basic workshop this coming Tuesday evening. This was certainly not the intent. An email was sent personally to all first year dancers but as the response was very low we thought, due to the time constraint, that the phone tree should phone around to see if there was any interest. (We have been told by some dancers that they do not check their email very often!) If the invitation appeared to imply that one “needed” a workshop that was unfortunate. We are very glad that you feel positive about your progress. We hope that those who feel more confident would come out and help the newer dancers. Our classes in January were rather intensive – normally what was taught in January is taught over many months during club nights. This was a new idea for the club and one which will have to be assessed for future classes. Unfortunately quite a few people got ill during February or had previously arranged plans which caused them to be absent during the subsequent weeks. On returning, some expressed frustration and the feeling of being very discouraged. The executive felt that they needed to offer some means of helping. When dancers are feeling that they are not understanding the moves and are merely being pushed or pulled around, that is not fun and not what square dancing is all about. It was decided that all first year dancers would be informed about it. If there was sufficient interest to proceed, all the dancers at the club were to be informed this Monday and invited to come and dance. No one is being forced to attend any extra sessions. If any message was relayed in an inappropriate way, our apologies. Our volunteers try to do the best they can! Speaking personally, I am always glad of the opportunity to attend a dance workshop at any level. This past weekend Howard and I travelled to a dance weekend in the States for the opportunity to improve our level of dancing and to participate in workshops. At the beginning of each workshop the caller asked the dancers to name moves they would like to work on. It was helpful even though we have been dancing our current level for 5 years. An invitation to a workshop at your level does not imply a lack of competence but an opportunity to get more floor time and practice. Thank you to all the new dancers who enjoyed our evening that being March 20th a teach night for New Dancers that joined us in Sept and Jan this year. Of the Squares danced most were New and very Pleased we offered this refresher night of practice in a smaller group, Thanking us for doing. Thank You to the Angels who are always there when called upon to help any where, anytime in our club. To every Dancer in our Club it is Our pleasure to be there to answer questions or help if you wish to ask. Thanks for the extra dancing class last night, I found it very helpful, Cathie..